The 2014 Winship Win the Fight 5K included hundreds of Emory students, faculty, staff and alumni as participants or volunteers. The 2014 race handily beat its $500,000 fundraising goal. This year's goal is $700,000. Bib / timing chip pick up: 7 a.m. Walk / run start: 8 a.m. Registration is officially open for the 5th annual Winship Win the Fight 5K, the walk/run fundraiser to benefit cancer research, held this year on Saturday, Oct. 3. The Winship Cancer Institute walk/run starts at 8:30 a.m. and ends on the Emory campus at McDonough Field on Asbury Circle, after winding through the historic Druid Hills neighborhood. Registration, which closes Sept. 30, is $35 for non-chipped timed runners and walkers and $40 for a timing chip. Grand marshal is John Schuerholz, former president of the Atlanta Braves. Schuerholz was successfully treated for prostate cancer last year at Winship at Emory Saint Joseph’s Hospital. Funds raised go directly to cancer research including pilot grants, laboratory equipment and programs that directly benefit cancer research and patient care at Emory. 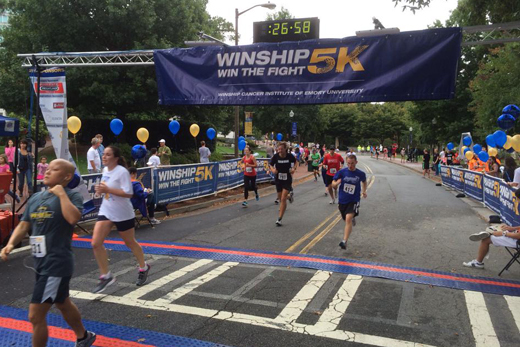 The Winship Win the Fight 5K allows participants to direct their tax-deductible donations to benefit specific cancer research based on personal interests. The Winship 5K is a Peachtree Road Race qualifier. Those who want to participate virtually as a “Sleep-in Warrior” can donate to the cause and be recognized. Winship Cancer Institute of Emory University is Georgia’s only National Cancer Institute-Designated Cancer Center and serves as the coordinating center for cancer research and care throughout Emory. For more information, visit the race website or call 404-727-6175.